Pedro and Marcos Alonso combined brilliantly for Chelsea this evening, as the forward scored the Blues’ third against Crystal Palace at Stamford Bridge. The home side had gone ahead just minutes earlier through Alvaro Morata, and it was fellow Spaniard Pedro who struck to give Maurizio Sarri’s side a two-goal lead against the Eagles. 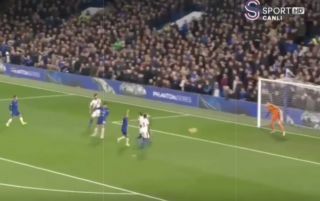 A fine cross into the box from Alonso found it’s way to Pedro, who gave Wayne Hennessey no chance with his finish, as he put his side in a commanding lead against Roy Hodgson’s men. Here’s a clip of Pedro’s goal for Chelsea. Is that now game over?